'Italian Style' and 'American Style' Biminis for Boats of different sizes. 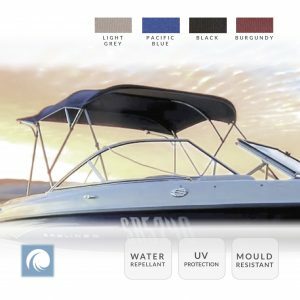 Range of sturdy Aluminium Frame Bimini to fit boats 1.2 meter to 2.5 meter wide. Heavy Duty Premium Fabric. Marine Grade Polyester. Tough Anodised Aluminium Frame Construction. Installed with deck mounts. All products in this range includes: Storage Boot Cover, Rear Support Poles, Stainless Steel Hook and Straps. Complete Fixing Kit and Instructions. Once installed, these are quick to put up and stow away. Bimini legs are attached to the top with pre-tensioned guy-ropes. Attach legs to counter sunk sockets. 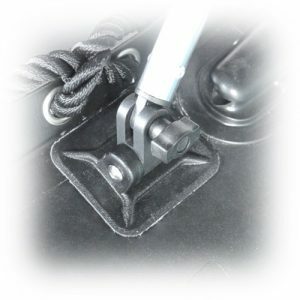 Counter sunk sockets are installed on a hard surface of the boat. 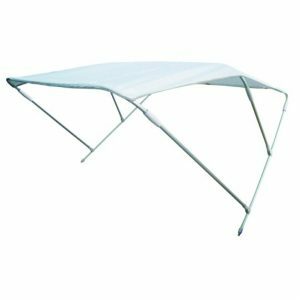 Boat Bimini Top Canopy, 3 Bow, Fits 120cm – 210cm Width. Range of 3 arm Bimini Top, suitable for Motor Boats, Cruiser Flybridge, Fishing Boats, Dinghies and Inflatables. Colour & Size options to fit boat widths between 1.2m and 2.1m. Heavy Duty Marine 600 Denier Polyester. 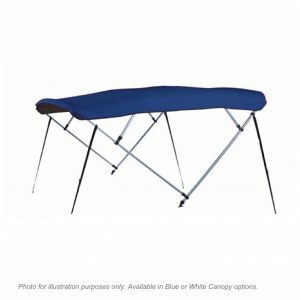 Boat Bimini Top Canopy, 4 Bow, Fits 210cm – 250cm Width. 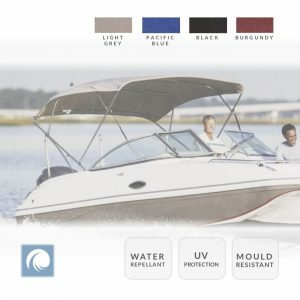 Range of 4 arm Bimini Top, suitable for Motor Boats, Cruiser Flybridge, Fishing Boats, Dinghies and Inflatables. Colour & Size options to fit boat widths between 2.1m and 2.5m. Glue-on deck mounts for fitting Biminis on Inflatables.